Memorable scene No. 2: Staff Sgt. Eddie Dohun (Caan) of the 101st Airborne keeps a promise to his wounded captain (Nicholas Campbell) by ensuring -- against the odds -- that he doesn't die during the military operation. Memorable scene No. 3: Under heavy fire from the Germans, U.S. Major Julian Cook (Redford) of the 82nd Airborne recites partial Hail Marys during a canvas boat crossing of the Waal River at Nijmegen. A Bridge Too Far (1977) -- Dirk Bogarde, James Caan, Sir Michael Caine, Sir Sean Connery, Edward Fox, Elliott Gould, Gene Hackman, Sir Anthony Hopkins, Hardy Krüger, Sir Laurence Olivier, Ryan O'Neal, Robert Redford, Maximilian Schell, Liv Ullmann, Denholm Elliott, Peter Faber, Christopher Good, Frank Grimes, Jeremy Kemp, Wolfgang Preiss. Like "The Longest Day" -- the story of the Allied invasion of Normandy on June 6, 1944 -- this true World War II drama with an all-star cast is based on a best-selling book by Cornelius Ryan. The subject is Operation Market Garden, a doomed Allied effort in September 1944 to end the war before Christmas. The objective: To take control of several German-held bridges in the Netherlands on the road to Berlin. The film, directed by Sir Richard Attenborough from a screenplay by William Goldman, features seven Oscar recipients: Caine, Connery, Hackman, Hopkins, Olivier, Redford and Schell. Memorable scene No. 1: General Bittrich (Schell) of the German SS Panzer Corps witnesses the arrival of Allied paratroopers at Arnhem. 2. Juliet of the Spirits (1965) -- Giulietta Masina, Sandra Milo, Mario Pisu, Valentina Cortese, Valeska Gert, Lou Gilbert, Silvana Jachino, Milena Vulotic, Elisabetta Gray, Sylva Koscina, Alba Cancellieri. Titled "Giulietta degli Spiriti" in Italian, this first feature-length color film by director Federico Fellini is a daring and dazzling array of phantasmagoria. Masina, the filmmaker's wife and frequent screen muse, plays a neglected housewife named Juliet who suspects that her husband (Pisu) is having an affair. As a result, she begins to have experiences that may be dreams or may be reality. Milo, who appeared in Fellini's Oscar-winning "8½." 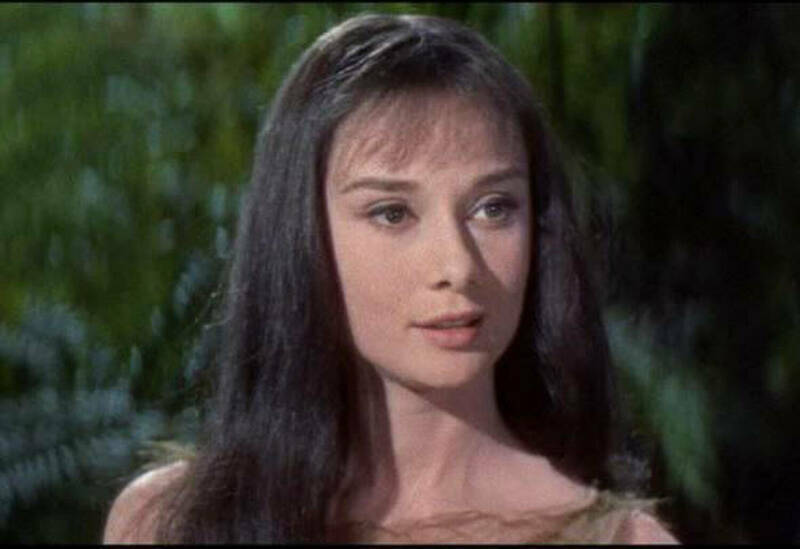 (1963), plays three characters, including Suzy -- Juliet's libidinous next-door neighbor. The energetic score was composed by Nino Rota, the prolific Italian also remembered for his contributions to "The Godfather" (1972) and "The Godfather Part II" (1976). 1. Green Mansions (1959) -- Audrey Hepburn, Anthony Perkins, Lee J. Cobb, Sessue Hayakawa, Henry Silva, Nehemiah Persoff, Michael Pate, Estelle Hemsley. Actor Mel Ferrer -- Hepburn's husband at the time -- directed this screen version of the 1904 romantic tale by William Henry Hudson. Perkins plays Abel Guevez de Argensola, a Venezuelan who flees his country during a rebellion and seeks refuge in an Amazonian forest. There he meets and becomes enchanted by Rima (Hepburn), a mysterious young woman who lives with an elderly guardian (Cobb). The movie's screenplay was adapted from Hudson's novel by Dorothy Kingsley, who received a 1954 Oscar nomination (along with Albert Hackett and Frances Goodrich) for "Seven Brides for Seven Brothers." Memorable quote: "It's called the Hata flower. It blooms for the space of a moon and then disappears. Yet it never dies. That very moment it blooms again in another place, in another part of the forest. If you look in this place tomorrow and it is gone, you must not be sad because you know it still exists, not very far away." -- Rima to Abel. This was one of Perkins' final films before he took on the role that forever changed his career -- Norman Bates in Sir Alfred Hitchcock's 1960 thriller "Psycho." Afterwards, he became typecast and played many more maladjusted characters. He returned as Bates in three "Psycho" sequels (including a TV movie) between 1983 and 1990. The Barretts of Wimpole Street (1934) -- Norma Shearer, Fredric March, Charles Laughton, Maureen O'Sullivan, Katharine Alexander, Ralph Forbes, Marion Clayton, ian Wolfe, Ferdinand Munier, Una O'Connor, Leo G. Carroll, Vernon Downing, Neville Clark, Matthew Smith, Robert Carleton, Allan Conrad, Peter Hobbes, Flush the Dog (as himself). Based on Rudolf Besier's 1930 stage play about the romance of 19th-century poets Elizabeth Barrett and Robert Browning, this screen version earned Academy Award nominations for Best Picture and Best Actress (Shearer as Elizabeth). Laughton co-stars as the imperious widower Edward Moulton-Barrett, who forbids his nine children -- including the eldest, Elizabeth -- from dating or marrying. Memorable quote: "I'm as sane and level-headed as any man alive. Yet, all these months, since first I read your poems, I've been haunted by you. And today, you are the center of my life." -- Robert Browning (March) to Elizabeth during their first face-to-face meeting at her house on Wimpole Street in London. 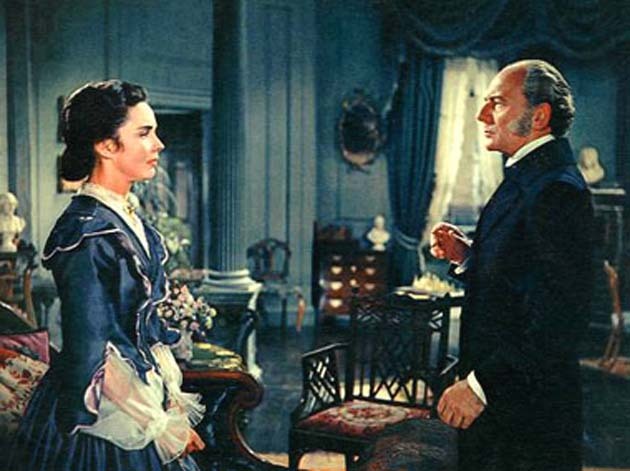 Director Sidney Franklin remade the movie in color in 1957 with Jennifer Jones as Elizabeth Barrett, Bill Travers as Robert Browning and Sir John Gielgud as Edward Moulton-Barrett. Movie crossover reference: Actress and stuntwoman Backlinie -- who played Chrissie Watkins, the movie's first shark attack victim -- reunited with Spielberg four years later. She appeared in the opening segment of the director's 1979 World War II comedy "1941." "Candygram! ": On the late-night sketch series "NBC's Saturday Night" (the original title for "Saturday Night Live"), Chevy Chase headlined a recurring "Jaws" spoof. He appeared in costume as a Land Shark that rang doorbells and tried to lure apartment dwellers into opening their doors. Jaws (1975) -- Roy Scheider, Robert Shaw, Richard Dreyfuss, Lorraine Gary, Murray Hamilton, Carl Gottlieb, Jeffrey C. Kramer, Susan Backlinie, Jonathan Filley, Ted Grossman, Chris Rebello, Jay Mello, Lee Fierro, Jeffrey Voorhees, Craig Kingsbury. Steven Spielberg became a star director, thanks to this screen adaptation of Peter Benchley's best-selling novel about the hunt for a killer Great White Shark near a coastal New England community. The film, which became the No. 1 box-office attraction of all-time, set the tone for subsequent summer blockbusters and the way they were marketed. The film received an Academy Award nomination for Best Picture and won Oscars for Best Music, Original Dramatic Score (John Williams), Best Film Editing (Verna Fields) and Best Sound (Robert L. Hoyt, Roger Heman, Jr., Earl Madery and John R. Carter). Although Spielberg wasn't nominated for Best Director, this was the first of of his 11 films to become a Best Picture nominee. He now is in sole possession of second place for the most Best Picture nominees by a director. The filmmaker with the most Best Picture nominations: director William Wyler, who had 13 between 1937 and 1969 (his films won the top Oscar three times). John Ford is third with nine. "Raiders of the Lost Ark" (1981). Also nominated for Best Director. "E.T. the Extraterrestial" (1982). Also nominated for Best Director. "The Color Purple" (1985). Also nominated for Best Director. "Schindler's List" (1993). Also won for Best Director. "Saving Private Ryan" (1998). Won for Best Director. "Munich" (2005). Also nominated for Best Director. "Lincoln" (2012). Also nominated for Best Director. In 1998, the American Film Institute ranked this suspense thriller at No, 48 on its list of the greatest movies of all time. When AFI updated the list in 2007, the film dropped to No. 56. Williams' much-admired music from the movie was ranked No. 6 on the AFI's list of the top 24 film scores of all time. It finished behind his composition for "Star Wars" (1977, the No. 1 choice), Max Steiner's "Gone With the Wind" (1939), Maurice Jarre's "Lawrence of Arabia" (1962), Bernard Herrmann's "Psycho" (1960) and Nino Rota's "The Godfather" (1972). A third Williams score -- "E.T. The Extraterrestrial" (1982) -- came in at No. 14. Memorable quote: Chief Brody's comment after his first encounter with the Great White was ranked No. 35 on the American Film Institute's list of the top 100 movies quotes of all time. Memorable scene: Quint reveals that he was a survivor of the ill-fated USS Indianapolis, a World War II Navy ship torpedoed by the Japanese in the Pacific Ocean. Only 317 men survived the shark-infested waters.